Limited Availability - Super Savings! Get 'em while they last. 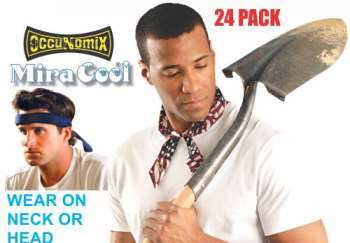 Evaporative Cooling Bandana 24 Piece Bandana Assortments are made of various assorted colors. It's a grab bag of patterns that always changes. Who cares about colors when it's hot? Remember, it's what's inside that keeps you cool! Tie one on! Millions sold!! To experience the #1 Cooling Bandana, simply hydrate in cool water, then wear around neck or head. The Evaporative cooling bandana is simple, economical, effective and reusable thousands of times. Available in many 100% cotton colors, patterns. One of our most popular products. These neck coolers really work great! Just soak them in water for 20 minutes or so and wear it around the neck or forehead for continuous cooling relief for up to two days!! Turn them often for extra relief. Evaporative Cooling Bandanas are great for work and play, indoors or out. If it's hot, you need one of these to cool down! Evaporative Cooling Crystals encased within the 100% cotton fabric absorb and hold up to 1000 times their weight in cool refreshing water. Evaporative Cooling crystals work in combination with the evaporation process. When worn against head, neck or body, cooling sensations are passed to pulse points and carried throughout the body.